JOBST SupportWear using special compression technology, enhances circulation so your legs feel refreshed and rejuvenated while swelling is minimized. JOBST compression therapy can make a real difference in leg health. You will find JOBST SupportWear comfortable, attractive and easy to put on. The market leader in medical leg wear for more than 60 years, JOBST offers a stylish collection of hosiery and socks for men and women. JOBST: because healthy legs are a part of a healthy life! SoSoft combines the look of a patterned fashion sock with leg therapy. JOBST soSoft makes legs look as good as they feel! JOBST UltraSheer is the perfect hosiery for any occasion. Choose from 4 styles: Knee High, Thigh High, Pantyhose, and Maternity. JOBST Women’s Casual is a medium-weight sock for everyday leisure and social activities. 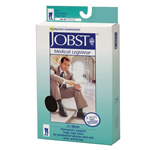 JOBST Men’s Dress is a high-quality, fashionable sock designed to complement business or business casual apparel. Wearing Compression for the First Time. Special Care for JOBST Thigh High Style Hosiery. The elastic fibers of your compression garment stockings will break down with wear. Proper care will increase the lifespan of your stockings, but you will need to replace your stockings or sleeve at about every 3-6 months depending on how often you are wearing and how you are caring for your garment. As a general rule, if your garment becomes easy to put on, it probably needs to be replaced.